We are Cub Scout Pack 35, Dan Beard Council, Fort Ancient District, Warren County, Lebanon,Ohio. We are members of the Boy Scouts of America. Our chartering organization is the First Baptist Church of Lebanon, Ohio. We have dens of Tiger Cubs, Wolf Scouts, Bear Scouts, Webelos I and Webelos II. For information on becoming a cub scout, call Bobby or Mary Ellen Craft at (513)932-1634. Click on the links at the left margin to see more photos. 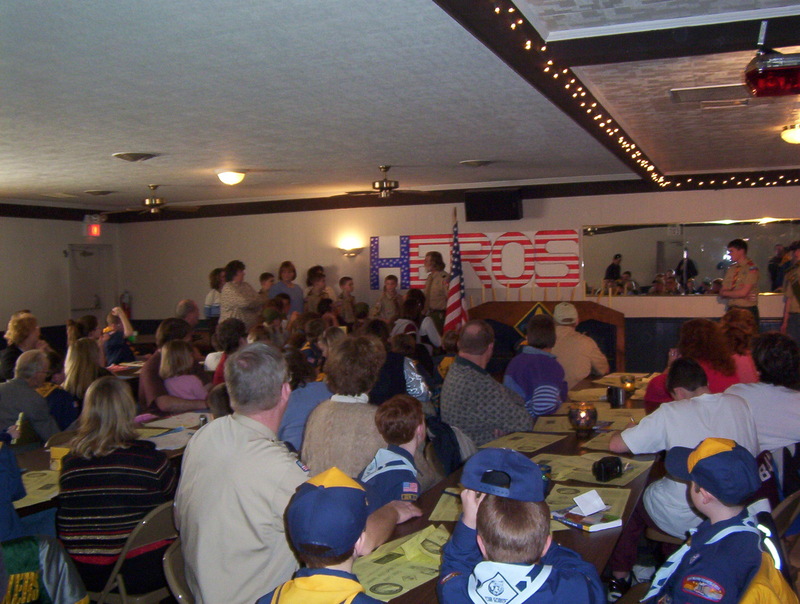 The Blue and Gold Banquet was held on February 23, 2003, at the Fraternal Order of Police hall on St Rt 122, Lebanon, OH. Several of our Webelos II Scouts crossed over into Boy Scouts. Several Tiger Cubs, Wolf Scouts,Bear Scout, Webelos I, and Webelos II earned badges. We were served a wonderful meal, buffet style, which consisted of spaghetti, lasagna, salad, and breadsticks by Bartoni's of Lebanon. The leftovers were taken to some local women's shelters.